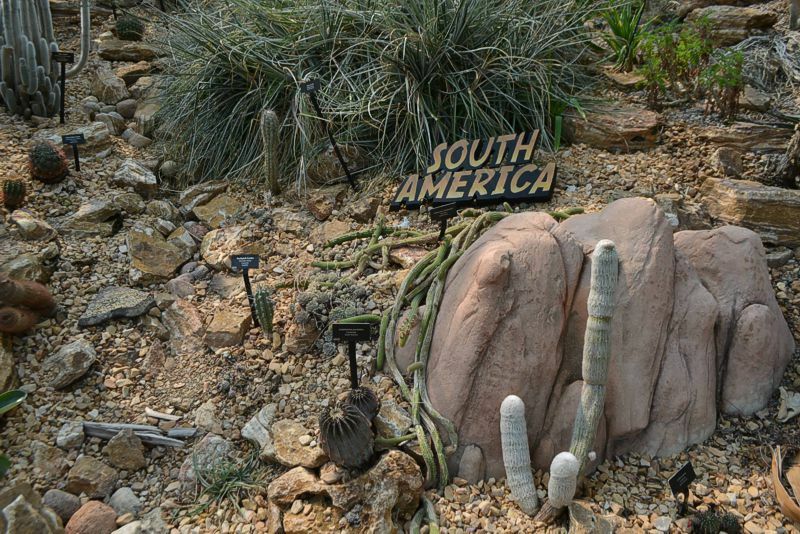 The deserts of the American Southwest as well as Africa, Madagascar, South America and Mexico are represented in The Mitchell Park Horticultural Conservatory’s Desert Dome. 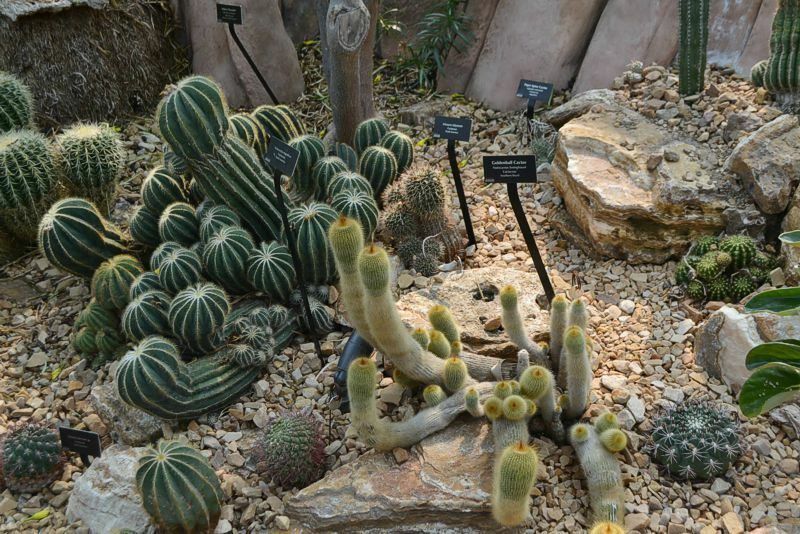 A world class collection of cacti and succulents thrives in a natural desert setting. 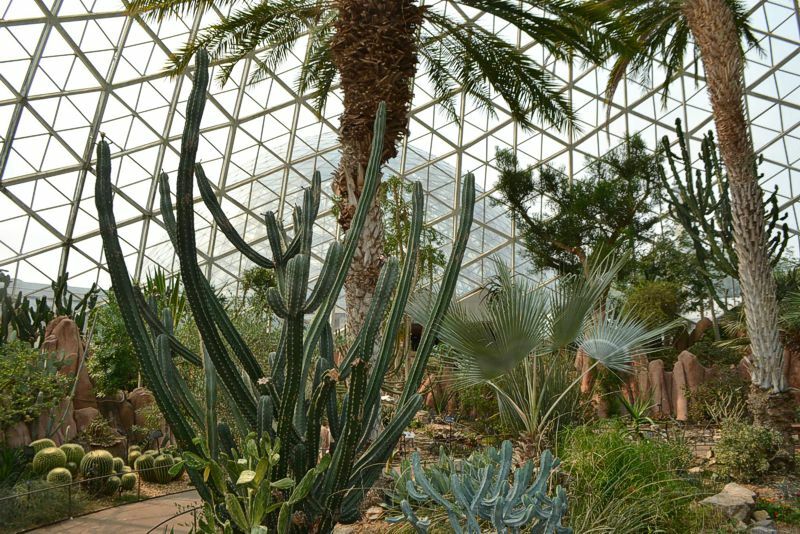 The Desert Dome is divided geographically into Old Word and New World habitats. 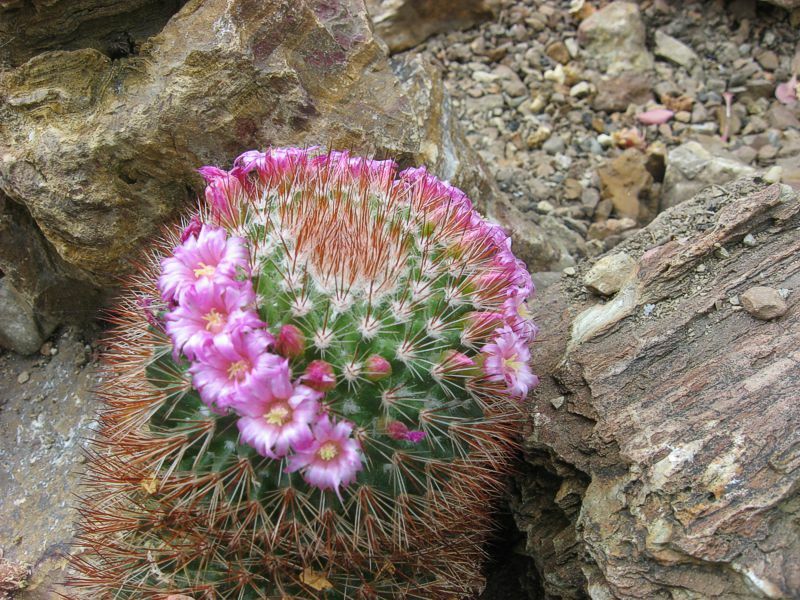 Visit the Sonoran, Northern Mexico, and even mountainous South American desert plantings. 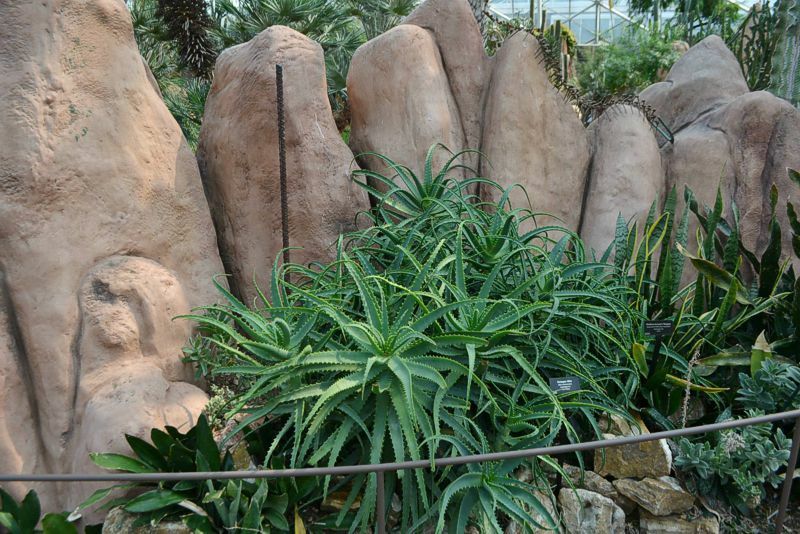 Enjoy the Madagascar collection, where endangered and unusual plant forms find sanctuary, and the South African and Canary Island collections, where you may just see some familiar plants. 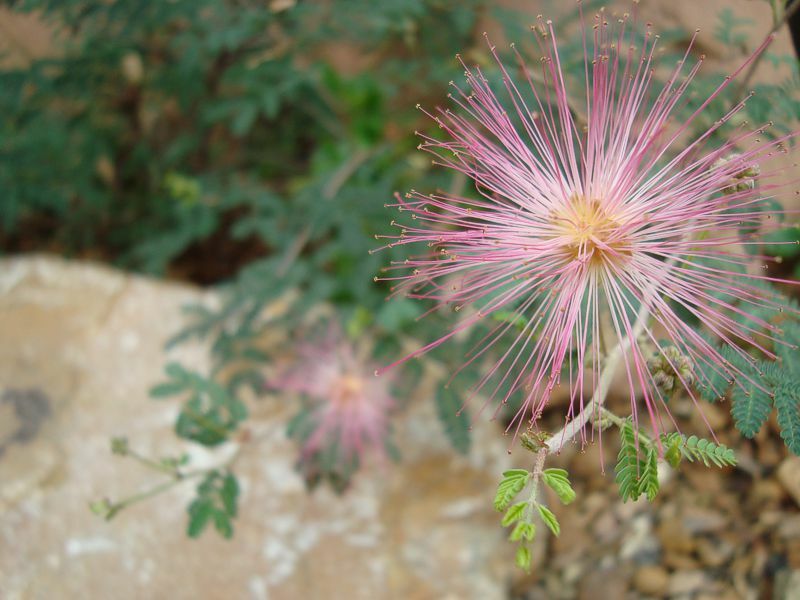 Around the pool in the oasis, find native crop plants and an ethnobotanical garden. Your desert experience will be one to remember at the Domes! An island off the east coast of Africa, Madagascar's isolation from the mainland has facilitated the evolution of plant species found nowhere else on Earth. 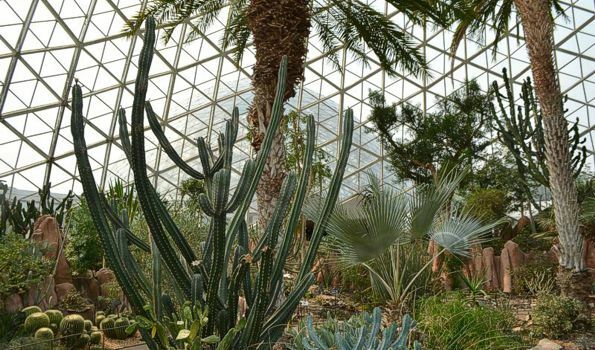 The Desert Dome collection is one of the largest in the United States. Whenever Domes botanists could not obtain specimen plants from other collections, they started plants from seed sent directly from Madagascar. Familiar "friends" such as Euphorbia milii (crown of thorns) and Catharanthus roseus (Madagascar periwinkle) will greet you as well as bizarre trees (Operculacaria) and thorny shrubs (Alluaudia and Pachypodium) that shed their leaves during drought or store water in large swollen stems and roots called caudexes. 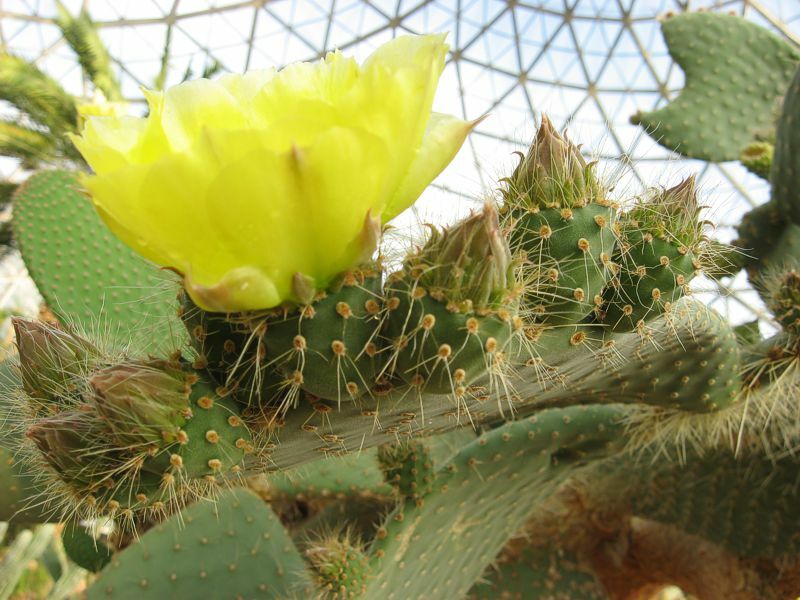 Other unique plant categories, or genera, in the Desert Dome collection include Didierea, Adenia, Cyphostemma, Uncarina, and rare species of euphorbias. When the succulents of North America go dormant for the winter, the aloes of Africa begin to bloom. 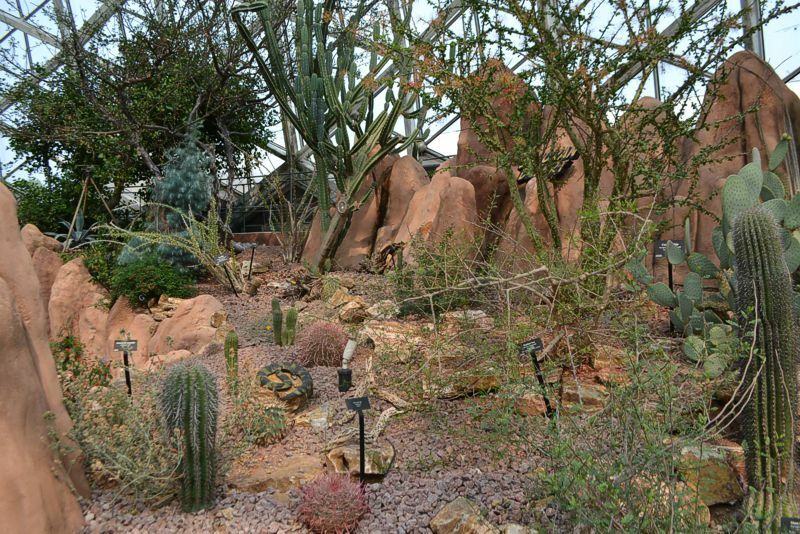 Overhead you will see tall, tree-form euphorbias and caudex-type plants, or caudiciforms, such as the Namibian grape (Cyphostemma juttae). At your feet are varieties of Lithops (living stones) that store water in leaves that mimic small stones. Perhaps the most intriguing specimen of all is the Welwitschia mirabilis from southwest Africa. The plant's long taproot allows its stiff leathery leaves to survive for centuries on little more than coastal fog. Equally interesting are the cycads, Encephalartos ferox (Zululand cycad) and E. horridus (Eastern Cape blue cycad), which are ancient relatives of our familiar conifers. Featured on a small "island" along the walk is the splendid Dracaena draco, the dragon blood tree of the Canary Islands. It was so named because its red sap was once marketed as "dragon's blood" during medieval times. 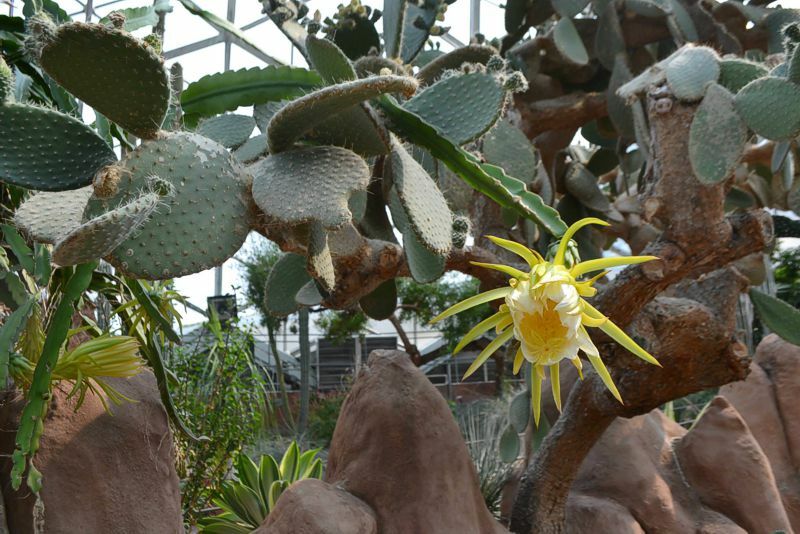 This plant can grow to an immense size and live for over a thousand years. Here you can also see several species of aeoniums, which are leafy succulents but look a lot like green daisies. In a deep pond shaded by date palms, you will find aquatic papyrus plants, used by ancient Egyptians to make paper. 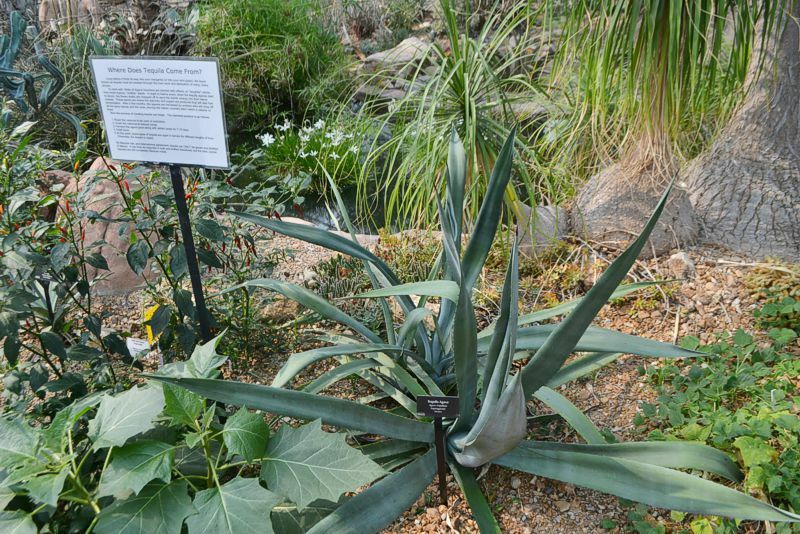 By the shore is the ethnobotanical garden with plants important to arid agriculture, including agaves and chili peppers. Chilis were one of the earliest plants to be cultivated in the New World and today are among the top 75 most consumed plants in the world. You might imagine tropical rainforests when you think of South America rather than deserts, but countries such as Argentina, Chile, Bolivia, Brazil, Peru and Colombia do indeed have extensive arid ecosystems. Some of these deserts are at high elevations that experience intense light levels. 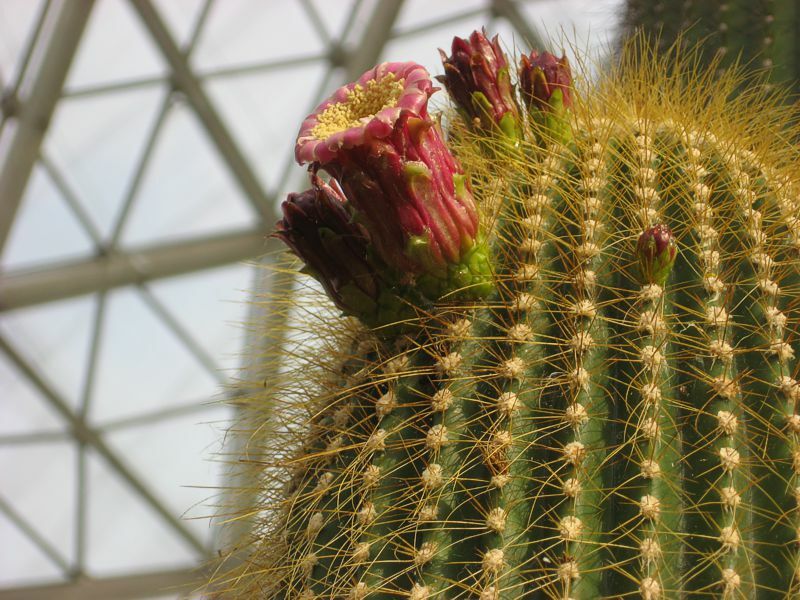 The cactus family is well represented, and you will find adaptations that include white wool, dense spines and columnar growth. 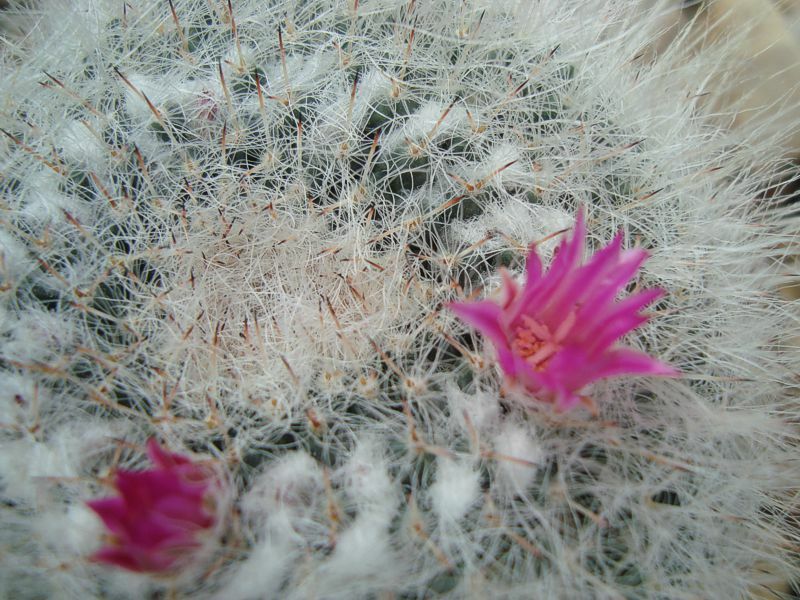 The white hair of the tall silver torch cactus (Cleistocactus strausii) can be particularly eye-catching in the sunlight. 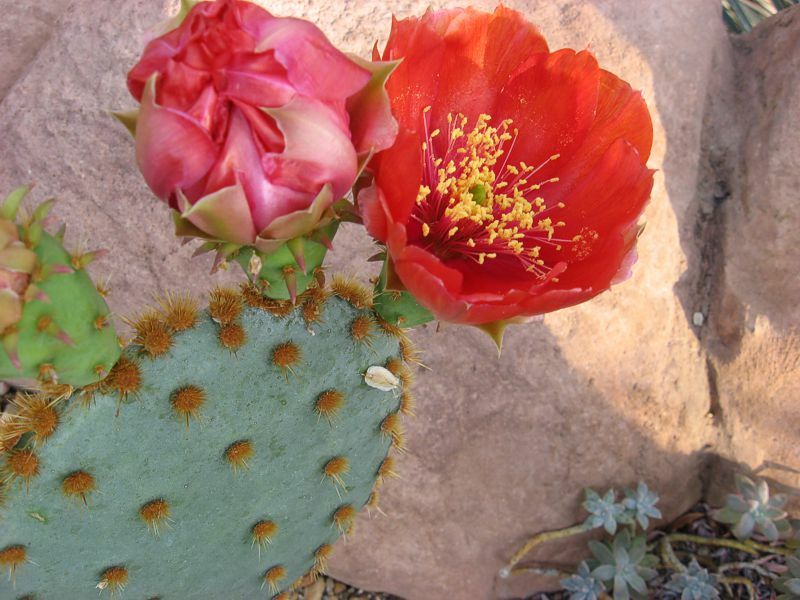 The deserts of North America – the Sonoran, Mohave and Chihuahuan, are rich in species and growth forms. 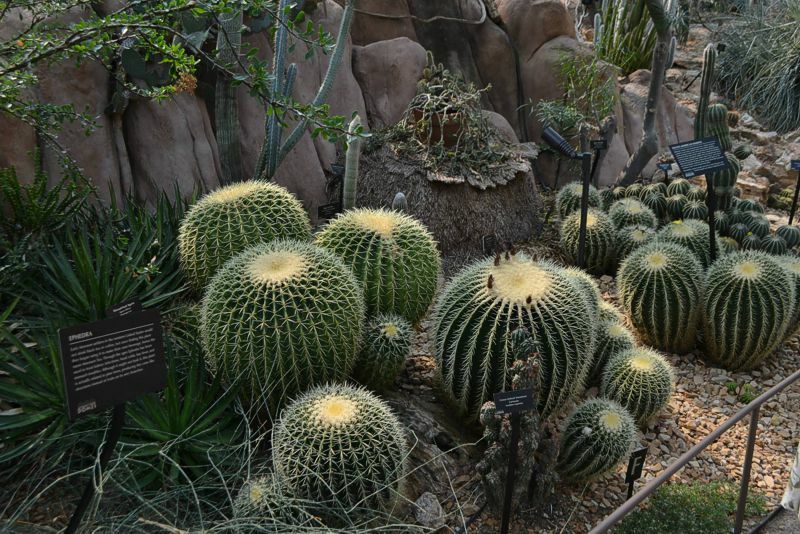 The Desert Dome collection reflects this diversity with a cacti collection that includes paddle-shaped prickly pears (Opuntia), round golden barrel cacti (Echinocactus grusonii), fiercely spiny fish-hook cacti (Ferocactus), and even clumps of towering, columnar wax cacti (Neobuxbaumia polylopha) that are probably older than you. Look for the bizarre boojum tree (Fouquieria columnaris), a rare plant from Baja California that survives bleak, arid conditions and can grow into an otherworldly form.